UK: At a large Union of Fascists rally in London, a couple of thousand communist infiltrators heckle the speaker to the point where open mass brawling breaks out. This brings the party bad publicity and costs them a number of influential supporters. France: Pierre Laval becomes the 112th Prime Minister of France. Spain: Day 326 of 985 of the Spanish Civil War. Spain: Day 691 of 985 of the Spanish Civil War. CBI - China: Day 336 of 2,987 of the 2nd Sino-Japanese War. Day 121 of 124 of the Battle of Henan. Germany: In Berlin, Germany signs separate non-aggression pacts with Latvia and Estonia. CBI - China: Day 701 of 2,987 of the 2nd Sino-Japanese War. CBI - Mongolia: Day 28 of 129 of the Battle of Khalkhin Gol, a border dispute between the Soviet Union and Japan. Atlantic: German sub U-48 sinks the British ship FRANCIS MASSEY 10 miles north of Ireland. ETO - Norway: Day 60 of 63 of the Battle of Norway. Evacuations to the UK continue as more troops leave Narvik. King Haakon VII and the Norwegian government leave Tromsö. ETO - France: Day 29 of 44 of the Battle of France. Rommel's troops march down the French coast toward Rouen, while Kleist's troops are held up by French defensive lines between Amiens and Péronne. The Allied troops fall back to the Bresles front, 60 miles north of Paris. Meanwhile, the French Air Force bombs Berlin. CBI - China: Day 1,067 of 2,987 of the 2nd Sino-Japanese War. Day 206 of 381 of the Battle of South Guangxi. Day 38 of 49 of the Battle of Yichang. USA: President Roosevelt learns that Germany is unlikely to invade the Iberian Peninsula (Spain and Portugal) and suspends plans for the occupation of the Portuguese Azores islands. Atlantic: The first of five heavy night raids by the RAF begins on Brest, as the PRINZ EUGEN is sheltered there. Poland: Polish physician Zygmunt Klukowski's diary entry for this date notes his observation of heavy German military traffic moving east. MTO - Libya: Day 59 of 256 of the Siege of Tobruk. East Africa: Day 363 of 537 of Italy's East African campaign in the lands south of Egypt. CBI - China: Day 1,432 of 2,987 of the 2nd Sino-Japanese War. PTO: Day 4 of 4 of the Battle of Midway, the most important naval battle of the Pacific Campaign of World War II. The crippled USS YORKTOWN sinks en route to Pearl Harbor. Meanwhile, the USS ENTERPRISE and USS HORNET begin heading north to Alaska. 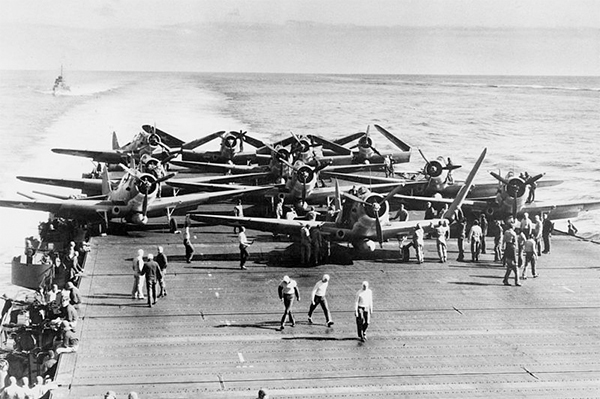 US Navy Douglas TBD-1 Devastators of Torpedo Squadron 6 (VT-6) unfolding their wings on the deck of USS ENTERPRISE (CV-6) prior to launching for attack against four Japanese carriers on the first day of the Battle of Midway. The squadron lost ten of fourteen aircraft during their attack against the Japanese carrier fleet during the Battle of Midway. With this decisive victory of the Battle of Midway, the balance of naval power in the Pacific shifted decidedly from Japan to the United States. The US Navy would now take the offensive in the Pacific war. After driving most of the Japanese out of New Guinea, making Australia safe from potential Japanese attack, there will be a year long lull in the Pacific as the US massively gears up its forces, but the subsequent campaigns will then be unrelenting until Japan's surrender. Atlantic: Day 145 of 169 of Germany's Second "Happy Time," during which U-boats sink 609 Allied ships with little risk. ETO - France: All Jews over the age of six are forced to wear the Star of David in occupied France. Russian Front - North: Day 273 of 872 of the Siege of Leningrad. Russian Front - North: Day 34 of 658 of the Siege of the Kholm Pocket. Russian Front - Center: Day 10 of 31 of Operation KREMLIN, a German diversion to trick the Soviets into thinking Moscow is their main objective instead of Stalingrad and the Caucasus. Russian Front - South: Day 221 of 248 of the Siege of Sevastopol, Crimean Peninsula. The Germans mount a new offensive taking the nearby town of Belbek. MTO - Libya: Day 13 of 27 of the Battle of Gazala. East Africa: Day 34 of 186 of the Battle of Madagascar. CBI - China: Day 1,797 of 2,987 of the 2nd Sino-Japanese War. Day 24 of 124 of Japan's Zhejiang-Jiangxi Campaign, launched to punish anyone suspected of aiding the Doolittle raiders in China. Roughly 250,000 Chinese will be killed. PTO: US 7th Air Force: Major General Clarence L Tinker, Commanding General 7th Air Force, is lost while leading a flight of early model B-24 heavy bombers from Midway Island for a predawn mission to find and bomb retreating Japanese ships from the Battle of Midway. His Liberator is seen going down out of control, but is never found. 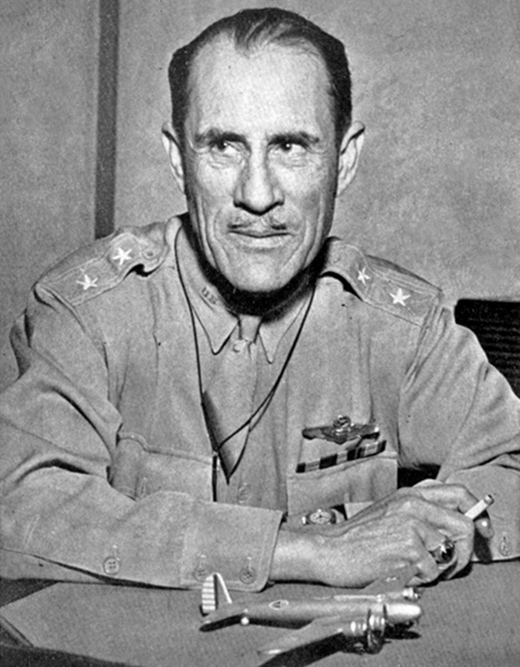 Major General Clarence Leonard Tinker was a career United States Army officer, the highest ranking Native-American officer and the first to reach the rank of Major General. He was raised as an Osage and learned the language and culture from his parents and extended family. During World War II he had been assigned as Commander of the Seventh Air Force in Hawaii to reorganize the air defenses. He believed that the Air Force was going to be critical to the entire war, and that Japan would eventually be defeated through a long-strike effort by air. On 04 Jun 42, the Japanese began their assault of Midway Island. At the end of the Battle of Midway, on June 7, General Tinker decided to lead a force of early model B-24s against the retreating Japanese naval forces. Near Midway Island his plane was seen to go out of control and plunge into the sea. General Tinker and eight other crewmen perished. The plane and bodies were never recovered. He was the first general to be killed in WWII. PTO: Day 109 of 337 of the Battle of Timor Island, a long guerrilla war ending in Japanese victory. PTO - Alaska: Day 1 of 435 of the Battle of Kiska, Aleutian Islands. Japanese troops begin sneaking onto Kiska, as well as making landings to the west on Attu Island. PTO - Australia: Day 8 of 9 of the Battle at Sydney Harbor. PTO - Malaya: Day 109 of 357 of the Battle of Timor Island. USA: Day 8 of 9 of the Los Angeles Zoot Suit Riots. The worst of the rioting occurs. Navy and Marine Corps command staffs now intervene, confining sailors and Marines to their barracks and declaring Los Angeles off-limits to all military personnel. More than 150 people had been injured and police had arrested more than 500 Latinos on charges ranging from "rioting" to "vagrancy." "Marching through the streets of downtown Los Angeles, a mob of several thousand soldiers, sailors, and civilians, proceeded to beat up every zoot suiter they could find. Pushing its way into the important motion picture theaters, the mob ordered the management to turn on the house lights and then ran up and down the aisles dragging Mexicans out of their seats. Streetcars were halted while Mexicans, and some Filipinos and Negroes, were jerked from their seats, pushed into the streets and beaten with a sadistic frenzy." 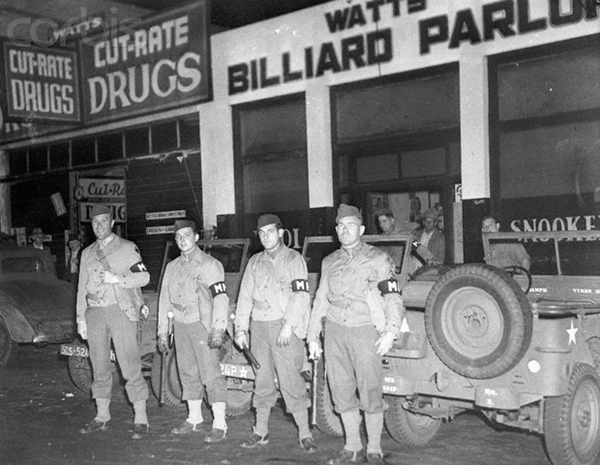 The local press lauded the attacks by the servicemen, describing the assaults as having a "cleansing effect" that were ridding Los Angeles of "miscreants" and "hoodlums." The Los Angeles City Council approved a resolution criminalizing the wearing of "zoot suits with reat [sic] pleats within the city limits of LA" after a councilman stated "The zoot suit has become a badge of hoodlumism". No ordinance was ever approved by the City Council or signed into law by the Mayor, although the council did encourage the War Production Board to take steps "to curb illegal production of men's clothing in violation of WPB limitation orders." White sailors and Marines had initially targeted only pachucos, but African-Americans in zoot suits were also attacked in the Central Avenue corridor area. This escalation compelled the Navy and Marine Corps command staffs to intervene on June 7, confining sailors and Marines to barracks and declaring Los Angeles off limits to all military personnel with enforcement by MPs and US Navy Shore Patrol personnel. Germany: Dutch POWs are transferred out of Colditz Castle in Germany for the camp at Stanislau in Ukraine. It had been decided earlier that the Oflag camp was to house US and British prisoners only. Russian Front - North: Day 638 of 872 of the Siege of Leningrad. Russian Front - North: Day 399 of 658 of the Siege of the Kholm Pocket. MTO - Italy: Day 17 of 20 of the naval and aerial bombardment of Pantelleria Island. US 9th Air Force bombs gun emplacements at the airfield. US 12th Air Force RAF Wellingtons night bomb targets at Pantelleria Island. During the day, US planes pound the island again. CBI - China: Day 2,162 of 2,987 of the 2nd Sino-Japanese War. PTO: Day 12 of 47 adrift in a raft for the survivors of B-24 GREEN HORNET that crashed 850 miles from Hawaii. PTO - Alaska: Day 366 of 435 of the Battle of Kiska, Aleutian Islands. PTO - New Guinea: Day 47 of 148 of the 2nd Battle of Lae-Salamaua. US 5th and 13th Air Forces provide air support. PTO - Solomon Islands: The Japanese renew their air offensive against Guadalcanal but are intercepted by the US 13th Air Force. ETO - France: Day 2 of 49 of Operation OVERLORD, the Allied invasion of Normandy, France, known forever simply as D-Day. D-Day+1: Allied Air Forces provide air support. ETO - France: Day 2 of 62 of the Battle of Caen. British troops liberate Bayeux, five miles inland and begin Operation PERCH to take Caen. ETO - France: Day 2 of 25 of the Battle of Cherbourg. Germany: The administration at the Auschwitz II-Birkenau concentration camp orders four sieves to sift through the human ashes. Russian Front - North: Day 127 of 191 of the Battle of the Narva Isthmus, Estonia. Both German and Soviet troops remain locked in their defensive positions. MTO - Italy: Day 3 of 16 of the Battle of the Trasimene Line (north of Rome). US troops capture Civitavecchia on the western coast. Allied Air Forces provide air support. CBI - Burma: Day 95 of 166 of the UK's Operation THURSDAY. Monsoon season bogs down all operations. CBI - Burma: Day 90 of 147 of the Battle of Myitkyina. US 10th Air Force provides air support. Monsoon season bogs down all operations. CBI - Burma: Day 68 of 302 of the Chinese Salween Offensive. US 14th Air Force provides air support. Monsoon season bogs down all operations. CBI - China: Day 2,528 of 2,987 of the 2nd Sino-Japanese War. Day 52 of 259 of Japan's Operation ICHI-GO. CBI - India: Day 92 of 118 of the Battle of Imphal-Kohima. The incoming British 2nd Division is now only 55 miles from Imphal. Anglo-Indian and Japanese troops engage in a bloody clash at Ninthoukgong. PTO - Caroline Islands: US 7th Air Force bombs targets on Ponape Island. PTO - New Guinea: Day 12 of 83 of the Battle of Biak. 5th Air Force provides air support. US troops capture the airfield at Mokmer. PTO - New Guinea: Day 176 of 597 of the Battle of New Britain. US 13th Air Force provides air support. PTO - New Guinea: Day 47 of 481 of the Battle of Western New Guinea. 5th Air Force provides air support. PTO - Solomon Islands: Day 220 of 295 of the Battle of the Bougainville Islands. US 13th Air Force provides air support. Norway: King Haakon VII returns to Norway on the fifth anniversary of his leaving the country. Germany: The Western Allies make German citizens in their occupation zones watch films about the Buchenwald and Bergen-Belsen Concentration Camps. CBI - China: Day 2,893 of 2,987 of the 2nd Sino-Japanese War. Day 68 of 91 of the Battle of Zhijiang. US 14th Air Force provides air support. Japanese troops continue pulling out of China. Day 60 of 60 of the Battle of West Hunan (near Zhijiang). The Japanese have retreated from the area. PTO: USS SEA CAT sinks a 400-ton Japanese schooner with her deck gun. Elsewhere, the USS SEGUNDO sinks a Japanese ship. PTO - Dutch East Indies: Day 38 of 52 of the Battle of Tarakan Island. PTO - Japan: US 20th Air Force B-29s drop incendiary and high explosive bombs on Osaka, burning over 2 square miles of the city, destroying over 55,000 buildings. PTO - Japan: Day 68 of 83 of the Battle of Okinawa. PTO - New Guinea: Day 528 of 597 of the Battle of New Britain. US 10th Air Force provides air support. PTO - New Guinea: Day 412 of 481 of the Battle of Western New Guinea. US 10th Air Force provides air support. The first Allied cargo ship in three years enters the Wewak harbor. PTO - Palau Islands: US 7th Air Force bombs the boat repair basin on Aurapushekaru Island. PTO - Philippines: Day 230 of 299 of the 2nd Battle of the Philippines, aka the Liberation of the Philippines or the Philippines Campaign. PTO - Philippines: Day 175 of 244 of the Battle of Luzon. 5th Air Force provides air support. PTO - Philippines: Day 90 of 159 of the Battle of Mindanao Island. 5th Air Force provides air support. PTO - Philippines: Day 82 of 135 of the Battle of the Visayas region. US 5th and 7th Air Forces provide air support. The female "pachuca" zoot suiter donned the same style of zoot suit that her male counterparts wore, both representing a new generation of Mexican American youth.